Based on the engine of well-being model (Jayawickreme et al. 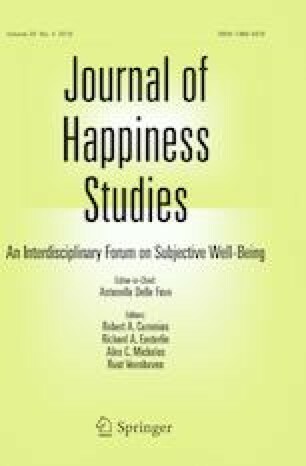 in Rev Gen Psychol 16(4):327, 2012), we examined the potential mediating role of two cognitive well-being factors (i.e., hope and life satisfaction) in the relation between perceived family support and goal-directed behaviors (i.e., engagement in meaningful instrumental activity). We employed a longitudinal mediation design, using three waves of data across 3 years from a large sample of adolescents (Mage = 14.6 years, SD = 2.06). We tested the model in the full sample first and then in two racial groups via multi-group comparison. In the full sample, we found that hope fully mediated the relation between perceived family support and engagement in meaningful instrumental activity. The mediation effect of life satisfaction was non-significant. Multi-group analysis revealed that for European American adolescents, the total effect of perceived family support on goal-directed behaviors was non-significant, but hope fully mediated the relation between family support and engagement in meaningful instrumental activity. For African American adolescents, the total effect of perceived family support on goal-directed behaviors was significant, and hope fully mediated the association between family support and meaningful instrumental activity. These findings suggest that perceived family support exerts a stronger effect on positive behaviors in African American adolescents compared to European American adolescents, but hope functioned as the “engine” in the proposed model, transferring energy from perceived family support to goal-directed behaviors in adolescents, regardless of race. Future directions and implications are discussed. The online version of this article ( https://doi.org/10.1007/s10902-019-00117-7) contains supplementary material, which is available to authorized users.